(a) What is the ratio of the strength of the gravitational force to that of the strong nuclear force? (b) What is the ratio of the strength of the gravitational force to that of the weak nuclear force? (c) What is the ratio of the strength of the gravitational force to that of the electromagnetic force? What do your answers imply about the influence of the gravitational force on atomic nuclei? d) Gravity has a negligible effect on atomic nuclei. This is College Physics Answers with Shaun Dychko. Table 4.1 gives us comparison between the different fundamental forces. So the force of gravity is about ten to the minus 38, compared to the force of, the strong nuclear force, which is one. So the ratio is ten to the minus 38, the gravity is way way way smaller than the strong nuclear force. Ratio of force of gravity to the weak nuclear force is ten to the minus 38 over ten of minus 13, which is a ratio of ten to the minus 25. Comparing to the electromagnetic force, it’s ten to the minus 38 over ten to the minus 2, which is ten to the minus 36. 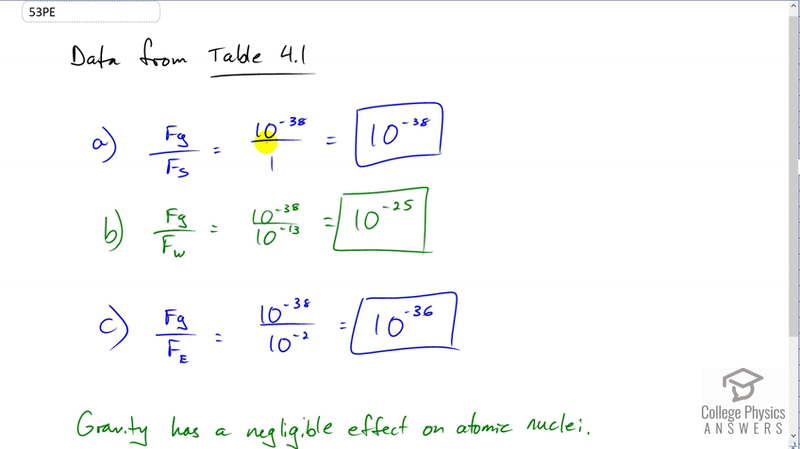 So gravity is clearly extremely weak on the scale of atomic nuclear, so in comparison to these nuclear forces, gravity has a negligible effect on atomic nuclei.